APCodes.com: Quickly Find Amazon Promo Codes & Discounts up to 70%! We all know that Amazon offers tons of awesome deals, but did you know you can add to your savings by using promo codes on the site? Amazon promo codes can be tricky to find though because most are not prominently displayed on the site or announced. Not only does Amazon sell products, but there are 1000s of individual "stores" and sellers selling the same items, all at different prices. If you're lucky, you may stumble upon a promo code offered by one of these non-Amazon stores. APCodes.com make it super easy to find these "hidden" codes. Simply enter a type of product you're looking for into their search bar and in seconds, you will be shown all the current promo codes you can use and where to use them. All the codes have a thumbs up/thumbs down feature that other users use so you can easily see if codes are still valid or not. I tested the feature out and searched for "Baby". My job is to hunt down coupons/codes, so I was surprised when I was shown 19 different codes that I could use...I wasn't aware of a single one! For example, if you visit the the Clever Beaver Toy Shop on Amazon, you can use the code XZ59L4Z2 to save 10% on any purchase of two or more toys from their shop. The only way I would've known about this code is if I had actually went to the Clever Beaver's Amazon shop. Since I didn't even know it existed, this probably would've never happened! 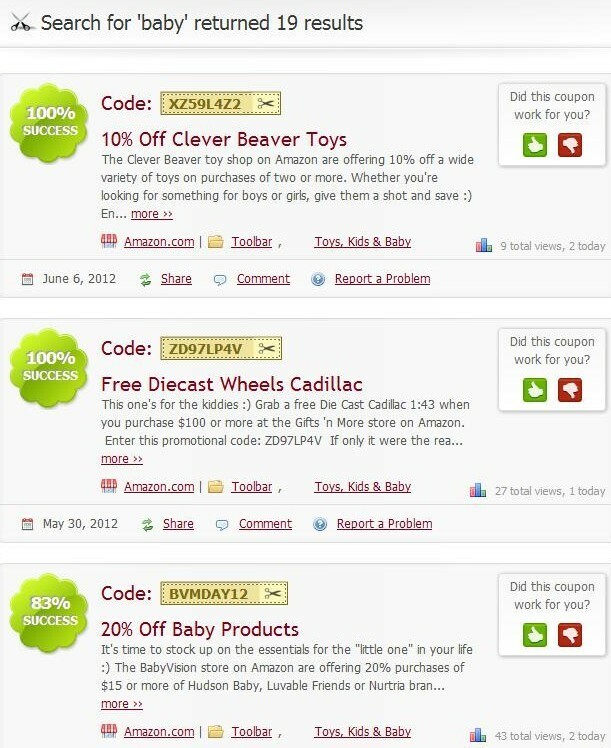 Another great feature APCodes offers is that you can easily find discounts up to 70% on 1000s of products in one click. All you have to do is pick a category and a discount level and click. You will immediately be brought to Amazon and be shown all the products in that category, at the discount you selected. I tested using the Beauty category at 70% discount. I was shown over 2000 products up to 75% off their list prices. For example, I found Aveeno Baby Lotion with a list price of $11.98. Amazon was selling it for $7.57, but I could buy from an individual seller and pay only $2.15! This is a great feature if you like to "window shop" on Amazon. If you plan on shopping at Amazon, I'd definitely head to APCodes.com first. Who knows what kind of codes or deals you'll find!